February 17, 2018 February 16, 2018 Dan O. Everyone knows everyone when you’re in New York. Nick (Adam Horovitz) is getting older and with that, he’s starting to realize that his days may be numbered. He lives with his wife Alyssa (Chloë Sevigny) and together, the two have forged something of a relatively comfortable existence. They have no kids, but for the most part, they seem fine with that as they’re just getting by and doing their thing. However, it all changes a bit when Naomi (Emily Browning), an Australian who begins working for Nick as he tries to complete an archival project for his father-in-law, leading Nick to rethink the life he’s lived so far. Meanwhile, a young married-couple, Buddy (Jason Schwartzman) and Jess (Analeigh Tipton), find their comfortable lives unsettled a bit too when he meets Naomi and starts something of a friendship that may, or may not, turn into something far more serious. Writer/director Alex Ross Perry wears his Bergman and Woody Allen influences on his sleeve and with that, you can sometimes toss him off as an imposter who doesn’t really have his own style, but instead, is just replicating what he’s been watching for his whole life. You can also look at him as a young, fresh, and talented voice in indie cinema where he takes rather unlikable characters, gives them a platform to tell their stories, and demand us to watch. So far, he’s been on something of a roll and while Golden Exits may not measure up to what he’s done in the past few years or so, it still shows that he’s got those influences running wild, as well as a general love for his characters, no matter how mean-spirited or upsetting they may be. And yes, this group is quite the unsettling bunch. 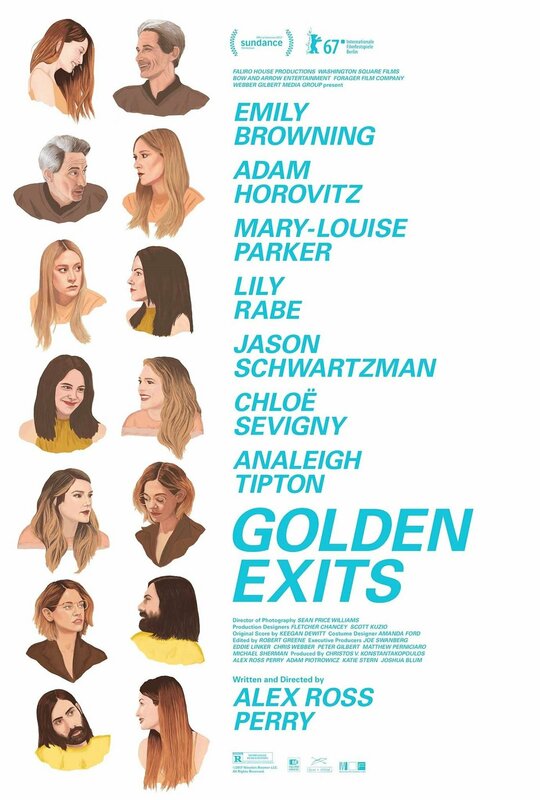 But what I think works best about Golden Exits is that its ensemble works well with everyone here, giving them more dimensions that even the script can’t really expand on. For instance, Nick could have easily been a dirty, older guy who uses his position of power to bed young assistants, but instead, he’s just a sad, lonely, and relatively confused guy who’s battling to the death with this mid-life crisis. Horovitz is good here because we see a soft side, but other times, a darker, dangerous side that we don’t ever see coming, but one that also feels earned. Cheer up, hipsters! Life can’t be all that bad! And that’s about how the rest of the cast goes – everyone’s got another side to them that we see, but honestly, it’s never fully developed. A part of me feels like Golden Exits may have been something of a rushed-job, where Perry had all of this time to script what he wanted to write, but didn’t get the opportunity to film nearly as much, therefore, leaving a lot of strands of plot just dangling in the air. There’s a lot of filling in the blanks here and perhaps, that’s the point; life itself doesn’t always have the easy answers and conclusions, and sometimes, we just have to make it all up ourselves. If this is the point, then it’s understood, but it doesn’t fully work. It gets in the way of some honest characters who, had they been more fleshed-out, could have helped the movie. Instead, it feels like an interesting rough-draft that has many more places to go, but the people in it are so good, it doesn’t totally matter, right? Consensus: With such a solid ensemble, Golden Exits works as a mildly interesting character-study that doesn’t go as far, or as deep as it definitely should have. It’s the cute Australians you always have to worry about.